Dysplastic (abnormally-growing) nevi (moles) are also called atypical nevi. 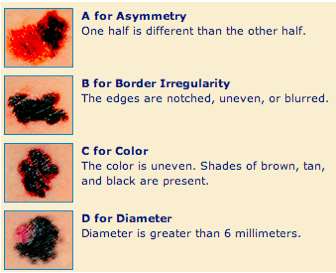 As their name implies, they are abnormal looking moles that may appear a lot like melanoma. Normal moles are common, small brown dots. Dysplastic nevi tend to have uneven color with dark brown centers and lighter, uneven edges. They can occur in almost everyone. They are generally normal-looking: symmetrically round and regularly shaped. Dysplastic nevi, on the other hand, are usually larger than common moles, have irregular borders, and can have different colors in the same mole. They are most common on the trunk of a male, but also as common on the calves on a female. Evolution: the evolution or change of the mole may be an early sign that the mole is becoming malignant. Melanoma can even develop within a dysplastic nevus. There is a higher risk of melanoma in those with dysplastic nevi than in the general population. People with this skin condition may have more than 100 miles. The greater the number of dysplastic nevi present, the greater the risk that person has of developing melanoma. Because of these risks, those with dysplastic nevi need regular skin exams by a dermatologist. If you suspect you may have dysplastic nevi, it is very important that you make an appointment to see an experienced dermatologist such as Dr. Rokhsar. The dermatologist will likely perform a biopsy in order to determine if your moles are in fact dysplastic. What is Dysplastic Nevi Syndrome? Those with DNS tend to acquire melanoma at an earlier age than those without abnormal moles. For individuals with DNS, having a family member who has had melanoma increases the risk of developing melanoma. About two to eight percent of the Caucasian population has these moles and those with two or more close blood relatives that have the disease, have an increased risk of developing melanoma, a serious type of skin cancer. However, those individuals who have dysplastic nevi syndrome and have no family history of melanoma, have a 27 times higher risk of developing melanoma compared to the general population. Individuals with this disorder have many large moles with differing shades of color. This predominantly develops in patients with a clear complexion, blue eyes, and the presence of numerous nevi. Lesions are located mainly on the upper trunk, back, limbs, abdomen, and arms. The number of moles can range from 50 to over 100. At least one of the moles is over 8 mm in diameter. At least one mole will have abnormal features such as: asymmetry, variable color within the mole, irregular borders, size over 6mm, or rapid change in appearance. If you suspect you may have atypical moles or atypical mole syndrome, make an appointment with your dermatologist at your earliest conveniences. The doctor may examine the mole(s) with a dermatoscope, or may perform a biopsy.